Caption slip reads: "Photographer: Glickman. Date: 1951-09-20. Reporter: Glickman. Assignment: Kid gets nut caught on finger. Van Nuys Receiving Hospital. Firemen try to remove nut on finger of Paul Morgan, age 3. 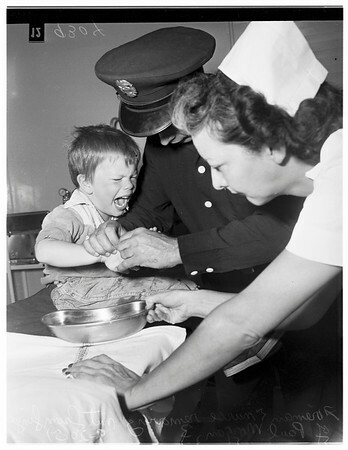 Attempts of receiving hospital staff and fire department proved futile and Mrs. Eileen Morgan took the boy to her own physician to have surgery performed".